We’d love your help. Let us know what’s wrong with this preview of Dawn Exodus by Kevin Partner. Could you stand against a Robot Empire? Humanity built a galactic empire with the help of robots then, one day, they left. Generational asteroid ship Dawn arrives at its target to find a brutal federation thriving in the embers of empire. Can the engineers and officers of Dawn survive this encounter? What happens when the Robot Empire returns to human s Could you stand against a Robot Empire? Generational asteroid ship Dawn arrives at its target to find a brutal federation thriving in the embers of empire. Can the engineers and officers of Dawn survive this encounter? What happens when the Robot Empire returns to human space? Could you stand against them? 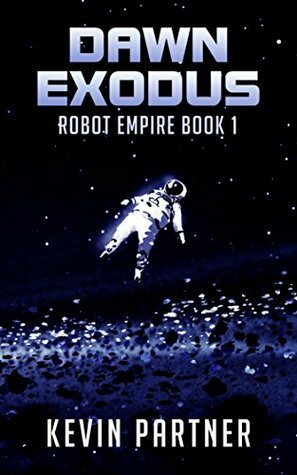 If you like Star Trek and Battlestar Galactica, you’ll enjoy Dawn Exodus, the first book in the Robot Empire series of science fiction adventures on a galactic scale. To ask other readers questions about Dawn Exodus, please sign up. Hal Chen's a fugitive from the Vanis Federation; it's Empress Victorea's a ruthless dictator. Her henchman Chancellor Marco Lucius, (a sociopath with delusions of grandeur) and his crew are giving chase; Hal has something they want badly and they're not giving up without a fight. Arla's part of a human colony aboard the arkship, DAWN, from planet Cluster 551. They're on a mission, looking for a mineral-rich asteroid that they can establish New Earth on. Arla (just chosen to be a Priest), encounters a glowing cuboid in an ancient ship she discovers while AWOL - and Hal - who persuades her to give him and the orb, ACE, sanctuary. ACE interacts with both Arla and Hal, to whom she 'links' via a brain implant and helps protect DAWN from the Federation's threats and nuclear weaponry aboard the Relentless. What is the truth about the Captain and officers that Arla must keep at all costs? Will Arla and the colonists end up sacrificing themselves to save Hal and ACE from falling into the wrong hands? What is the Federation's - and Lucius' - true intention regarding their 'prey'? Will/can ACE keep its promise to provide a new planet colony suitable for the human race on the far side of the galaxy, after improving the DAWN's technology? Can Arla cope with the pressure of everyone's expectations on her small shoulders? The answers to these and more questions will be answered in this fascinating novella from the keypad of skilled sci-fi newcomer Kevin Partner, that engaged me right up to the cliff-hanger ending. I would recommend it to fans of apocryphal storylines, Star Wars, rites-of-passage stories, W.A.L.L-e, Trekkies and more, as it has something for everyone in its well-thought out 3-dimensional characters, its detailed action scenes and warnings of what could be the fate of the human race, if it doesn't mend its ways and look after the planet Earth before it's too late. Rogue AIs meet generational ship full of robots. I like anything involving robots, this book was maybe 7% about robots, they were sentient and had reasonable positions of power so that is nice. The robots are limited by Asimov's laws which is rather annoying. On the plus side they have their own robot empire, one of the short chapters had a scene from it. The writing itself was alright, though the book had a massive problem with its organization. The first chapter started out strong, then the next Rogue AIs meet generational ship full of robots. The writing itself was alright, though the book had a massive problem with its organization. The first chapter started out strong, then the next half of the book was dull as chalk till it picked up again about half way. Personally my recommendation is that scenes should be introduced based on tension and not chronology. It seemed like the author organized the chapters about Arla in a chronological fashion so I had 0 interest in reading about her, and skipped most of her chapters because i had no reason to care about her. My recommendation to reorganize this book would be to stay on Hal's timeline/chronology and only use flashbacks where necessary. Also the ending was kind of anticlimactic as Arla had pretty much 0 effect on the outcome. At the very least she could have had them search the prisoners ship, but she basically had no ideas. This is a great book and was a fun read from start to finish. The story starts off with us finding ourselves in space on a ship piloted by a young man called Hal Chen. Hal has stolen something very valuable from the Empress Victorea of the Vanis Empire. She sent her very best spaceship to capture him. This book has some great characters in it. I particularly liked Ace, Hal and the Captains of the Dawn, both of them. These characters had some fun things about them. I also got a kick outta Empress This is a great book and was a fun read from start to finish. This book has some great characters in it. I particularly liked Ace, Hal and the Captains of the Dawn, both of them. These characters had some fun things about them. I also got a kick outta Empress Victorea. She sounds like an A1 b***h, but you might think differently about her when you read about her. The item that was stolen in the story is really interesting. What happens to it and because of it was great too. I won't tell you any more because of spoilers but you should read this if you want to known more, as it's really captivating. What makes this a great book is the pleasurable read that it is. It has a surfit of good one liners and some interesting and unexpected plot twists that were huge fun. ""You wish to escape the Vanis Federation?" Hal Chen, a very personable thief, trying desperately to outrun the flagship Relentless of the degenerating Vanis Federation, a young girl, Arla Farmer, born in the Valley and chosen for higher calling, Lucius, Chancellor of the Vanis Federation, with plans of his own, and ACE. This intriguing and original science fiction story is reminiscent of the classic S.F. stories of the 1900s, combining fast paced action, new world visions and gently posing quest ""You wish to escape the Vanis Federation?" Hal Chen, a very personable thief, trying desperately to outrun the flagship Relentless of the degenerating Vanis Federation, a young girl, Arla Farmer, born in the Valley and chosen for higher calling, Lucius, Chancellor of the Vanis Federation, with plans of his own, and ACE. This intriguing and original science fiction story is reminiscent of the classic S.F. stories of the 1900s, combining fast paced action, new world visions and gently posing questions about the growths of civilisation and humanity itself. What a great story. The characters are all. Amazing. This story had everything I love, action, twists and turns, and a diverse group of characters to keep everything moving. A Very Good Read. Robots, asteroid spaceship, empires - all well done and with the human characters clearly showing their motives and struggles to overcome the conflict situations. Very well done. This was a refreshingly original and well-written story. It had a few surprises that I never saw coming. A brilliant read with an epic and unexpected ending. I can’t wait for the next one! I write comic fantasy in the style of Terry Pratchett's Discworld novels and science fiction in the classic tradition of Asimov et al. Based in the south of England, I've been writing since my teens, alternating between funny and serious. In the mid 1990s, I became a regular columnist for PC Pro magazine and have written a number of business and craft books over the years. Fiction is my first love, I write comic fantasy in the style of Terry Pratchett's Discworld novels and science fiction in the classic tradition of Asimov et al. Fiction is my first love, however - I hope you enjoy the Strike series of comic fantasy novels and the Robot Empire of fast paced sci-fi.